In 1876 the consumption of alcohol in Britain reached a new peak. That year each person consumed an average of 34.4 gallons of beer, 1.27 gallons of spirit and 0.56 gallons of wine. Wine was drunk almost exclusively by the upper classes. 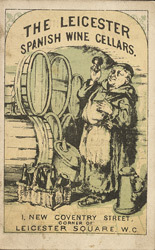 Duty on alcohol was one of the government's most important sources of revenue. In 1860, the Chancellor of the Exchequer William Gladstone introduced the Single Bottle Act, enabling shopkeepers to sell wine by the bottle for consumption off the premises. Before this time customers had to buy their wine wholesale in very large quantities.